Couros, Alec, and Katia Hilldebrandt. 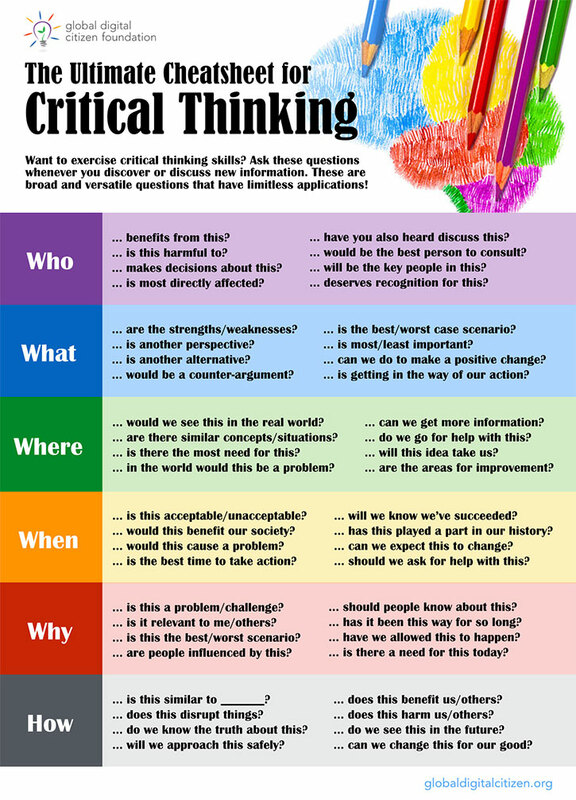 "Developing Critical Literacies: What We Need to Know in a “Fake News” World." Canadian School Libraries Journal, vol. 2, no. 2, Spring 2018. Barclay, Donald A. "Column: Can librarians help solve the fake news problem?" The Conversation, PBS, 6 Jan. 2017. Jacobson, Linda. 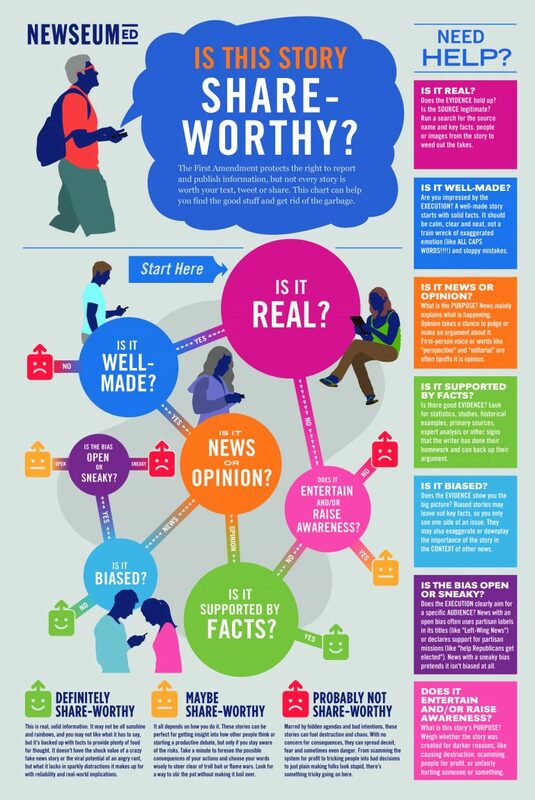 "The Smell Test: Educators can counter fake news with information literacy. Here’s how." School Library Journal, 1 Jan. 2017. ​Oh, Erin Wilkey. "10 Reasons Librarians Are More Important than Ever." Common Sense Education, Common Sense Media, 11 Apr. 2017. Spina, Carli. "Why Kids Need Data Literacy, and How You Can Teach It." School Library Journal, 9 June 2017. ​LaGarde, Jennifer. "Fake News, Alternative Facts and Librarians As Dedicated Defenders of Truth." The Adventures of Library Girl, 25 Jan. 2017. ​Stebbins, Leslie. “Markers of Quality: The Role of Librarians in Everyday Life Information Literacy | Peer to Peer Review.” (Library Journal, Oct. 2, 2016). Paschal, Maureen. "This School Librarian Teaches Students About (Actual) Fake News. Here’s How Parents Can, Too." On Parenting, Washington Post, 27 Dec. 2017. Farkas, Meredith. "Beyond Fake News: Determining what sources to trust." American Libraries, 1 June 2018. Gossel, Collin. "Library Creates Genius Bookmark to Teach Students How to Spot Fake News." Guacamoley: Get Your Scoop, July 2018. Gillespie, Amy. "Web Evaluation: Does This Website Smell Funny to You?" KQ, AASL, 9 Feb. 2018. Almy Library at BB&N (Cambridge MA). "Can You Trust That Website? TRRAPP." Almy Library, BB&N, 2018. ​"Is This Story Share-Worthy? Flowchart." Newseum, NewseumEd. ​Luhtala, Michelle, and Jacquelyn Whiting. "The Fake-News Fad: Let it Fade | Opinion." School Library Journal, 10 Apr. 2017. Librarians have always taught critical thinking! ​Bedley, Scott. "I taught my 5th-graders how to spot fake news. Now they won’t stop fact-checking me." Vox, 29 Mar. 2017. Gale. "Fight Fake News Harnessing the Power of your Statewide Gale Resources." Vidyard, 12 Apr. 2018. These are your tax-supported free-to-students database resources. ​​Snelling, Jennifer. "Top 10 sites to help students check their facts." Digital and Media Literacy, ISTE, 1 Feb. 2018. ​"Get Your Own ‘E.S.C.A.P.E. Junk News’ Poster Download." Newseum ED, 2018. Information Literacy is "being able to efficiently locate, accurately evaluate, effectively use, and clearly communicate information in various formats." “Digital literacy is the ability to use information and communication technologies to find, understand, evaluate, create, and communicate digital information, an ability that requires both cognitive and technical skills” (ALA 2013).